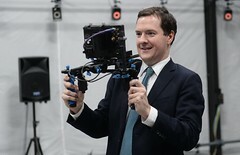 Chancellor visits Ealing Studios, a photo by HM Treasury on Flickr. I had expected George Osborne’s speech today to rule out a currency union and then discuss why a free-floating Scottish currency wouldn’t work either (I think it would, but that’s obviously not something he’d admit). Curiously, however, both his speech and the paper the Treasury released at the same time (PDF) practically ignore an independent Scotland’s alternatives to a currency union, and instead focus on comparing a currency union with the status quo (see for instance the graphs on page 34 in the Treasury’s paper). It seems George Osborne was thinking that if he ruled out a currency union, voters would naturally vote No to independence. I’m not sure it has occurred to him that we might vote Yes in spite of his speech (or even because of it). As I pointed out yesterday, a currency union is likely to benefit the rUK more than Scotland, so it’s still very likely Westminster will climb down after a Yes vote and agree to a currency union after all. However, even without a currency union, it’s by far most likely that an independent Scotland will be using the pound. We might either simply use the rUK pound without an agreement, or we might issue Scottish pounds that are linked in a so-called currency board to the rUK pound. I believe the latter option is much more likely (see yesterday’s blog post for more details), and the average voter really won’t care so long as the pound in their pocket is worth the same as before. In fact, most Scots will probably prefer having a Scottish pound linked to the rUK pound, because it means we’ll have Scottish banknotes and coins, and we’re used to this type of arrangement already. In reality, it would just mean that Scottish notes would be issued by the National Bank of Scotland rather than three commercial banks, which surely wouldn’t be a bad thing. By ignoring these options and by failing to explain why rUK politicians would opt for a solution that might harm rUK businesses, he shows that his sole purpose is scaremongering. He didn’t make this speech to provide visibility for rUK businesses (which would have been prudent), but to bully Scottish voters into voting No. You can’t bully us, George. The more I think about it, the more I think Salmond actually wants a pegged (to float in the future) currency rather than a currency union but just wants Westminster to reject the currency union so that he can make Westminster look bad. It’s like the manoovering over the referendum options. Yes, I think that’s quite likely. @stevesayers1 the major sell of a currency union is that it makes sense to have one for many companies in England.